How to send an email with Gmail as provider using Python? I am trying to send email (Gmail) using python, but I am getting following error. The Python script is the following. Also you should really create From:, To: and Subject: message headers, separated from the message body by a blank line and use CRLF as EOL markers. Once that is set (see my screenshot below), it should work. Click continue and this should give you 10 minutes for registering your new app. So proceed to doing another login attempt now and it should work. After enabling 'lesssecureapps', go for a coffee, come back, and try the 'DisplayUnlockCaptcha' link again. From user experience, it may take up to an hour for the change to kick in. Then try the sign-in process again. Not directly related but still worth pointing out is that my package tries to make sending gmail messages really quick and painless. It also tries to maintain a list of errors and tries to point to the solution immediately. 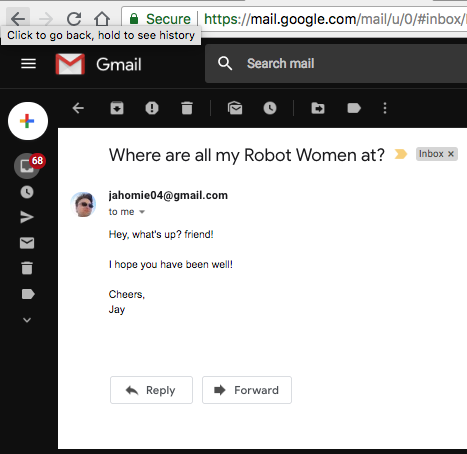 For the package/installation please look at git or pip, available for both Python 2 and 3.
sent_subject = "Where are all my Robot Women at?" sent_body = ("Hey, what's up? friend!\n\n"
"I hope you have been well!\n"
# SEND EMAIL OR DIE TRYING!!! I tested by sending an email from and to myself. Note: I have 2-Step Verification enabled on my account. App Password works with this! This setting is not available for accounts with 2-Step Verification enabled. 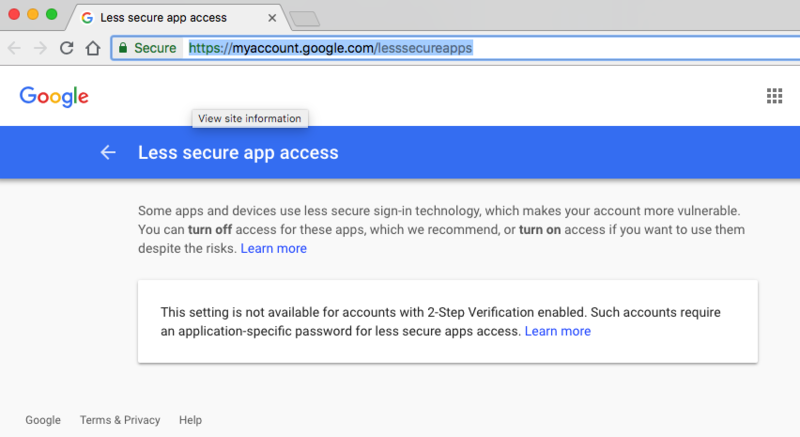 Such accounts require an application-specific password for less secure apps access. There is a gmail API now, which lets you send email, read email and create drafts via REST. Unlike the SMTP calls, it is non-blocking which can be a good thing for thread-based webservers sending email in the request thread (like python webservers). The API is also quite powerful. Of course, email should be handed off to a non-webserver queue, but it's nice to have options. It's easiest to setup if you have Google Apps administrator rights on the domain, because then you can give blanket permission to your client. Otherwise you have to fiddle with OAuth authentication and permission. Seems like problem of the old smtplib. In python2.7 everything works fine. Update: Yep, server.ehlo() also could help. Not the answer you're looking for? Browse other questions tagged python email smtp gmail or ask your own question. How to send email to multiple recipients using python smtplib? How to send an email with Python? What is a secure way to send an email using Python and Gmail as the provider?